14 night cruise sailing from Kiel aboard the MSC Meraviglia. 4 night cruise sailing from Kiel aboard the MSC Meraviglia. 1 night cruise sailing from Kiel aboard the MSC Meraviglia. 7 night cruise sailing from Copenhagen, Denmark aboard the MSC Meraviglia. 14 night cruise sailing from Copenhagen, Denmark aboard the MSC Meraviglia. 14 night cruise sailing from St Petersburg, Russia aboard the MSC Meraviglia. All beds can be both single or double (on request). Spacious wardrobe. Bathroom with shower or tub. Interactive TV. Telephone. Wifi connection available (for a fee). Mini bar and safe. Air conditioning. Surface approx. 19 sq.m. All beds can be both single or double (on request). Spacious wardrobe. Bathroom with shower. Interactive TV. Telephone. Wifi connection available (for a fee). Mini bar, Nespresso type machine and safe. Air conditioning. Surface approxim. 16 sq.m. All beds can be both single or double (on request). Spacious wardrobe. Bathroom with shower. Interactive TV. Telephone. Wifi connection available (for a fee). Mini bar and safe. Air conditioning. Surface approxim. frm 15 to 18 sq.m. Double bed, spacious wardrobe. Bathroom with tub and shower. Interactive TV, telephone and safe. Wifi connection available (for a fee). Bar setup, refrigerator and Nespresso type machine. Air conditioning. Surface approxim. 65 sq.m., with a balcony of 40 sq.m. with dining table and private whirlpool bath. All beds can be both single or double (on request). Spacious wardrobe. Bathroom with large shower. Interactive TV. Telephone. Wifi connection available (for a fee). Mini bar, Nespresso type machine and safe. Air conditioning. Surface approxim. 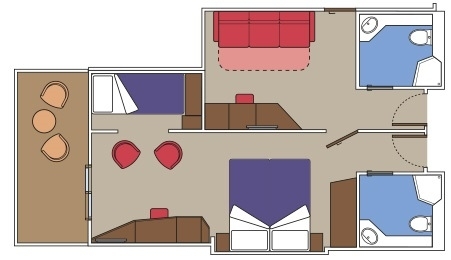 28 sq.m., with balcony. 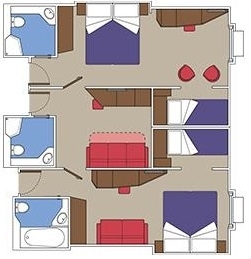 Double bed which can be converted into two single beds (on request), air conditioning, large wardrobe, bathroom with shower, interactive TV, telephone, wifi connection available (for a fee), mini bar and safe. Large angle balcony with private whirlpool bath. Surface approx 28-38 sq.m.